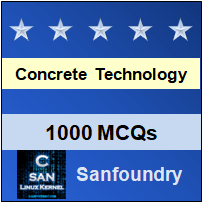 This set of Concrete Technology Multiple Choice Questions & Answers (MCQs) focuses on “Dry Process”. 1. What is dry process? Explanation: Grinding and mixing of the raw materials in their dry state is known as dry process and grinding and mixing of the raw materials in their wet state is known as wet process. 2. The raw materials is so hard (solid) that they ___ disintegrate by water. Explanation: The raw materials is so hard that they do not differentiate by water because the water might freeze in the mixture. Explanation: In this process calcareous material such as lime stone (calcium carbonate) and argillaceous material such as clay are ground separately to fine powder in the absence of water and then are mixed together in the desired proportions. Explanation: The blended meal is sieved and fed into a rotating dish called a granulator, water weighing about 12% of the meal being added at the same time. 5. What is the moisture content in slurry for dry process? Explanation: 12% is the moisture content in slurry for dry process. The moisture content in slurry for wet process is 35-50%. 6. Among the below statement, which one is correct for dry process? Explanation: The amount of heat required is lesser, so the required fuel amount is less for dry process and vice-versa for wet process. 7. “The machinery and equipments do not need much maintenance”. Is the statement true or false? Explanation: In dry process, raw materials cannot be mixed easily and therefore we need any extra energy and due to this machinery and equipments do need much maintenance. 8. What is the diameter of hard pellets? Explanation: Hard pellets about 15 mm in diameter are formed. The pellets are baked hard in a pre-heating grate by means of hot gases from the kiln. Explanation: Any residual would have a negative effect on the setting. The gypsum should be mixed under vacuum, if possible, and to the exact water/powder ratio. The gypsum should be sprinkled into the water. 10. What is the percentage of cement produced in dry process? Explanation: In this process calcareous material and argillaceous material are ground separately to fine powder in the absence of water and then are mixed together in the desired proportions. Dehydration zone requires a somewhat shorter distance than wet process.